529 plans are a great way to save for your child’s college education, but choosing the best 529 plan for your specific situation can be a daunting task. Almost every state offers at least one 529 plan and some states offer multiple plans, so right off the bat you have well over 50 options. Then, some states offer their residents an income tax deduction for contributions to their home state’s plan and other states don’t. And of course, every 529 plan has different investment options, different fees, different terms and conditions, and on and on. 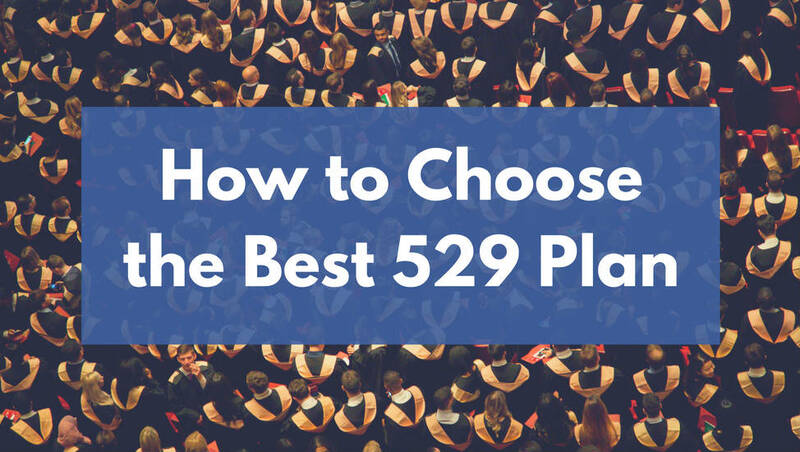 How can you possibly sort through all that information and choose the best 529 plan for you and your family? Here’s a simple 3-step process for doing just that. Step 1: Does your state offer an income tax deduction for 529 plan contributions? You’re allowed to use any 529 plan offered by any state and there isn’t any difference between them in terms of how you can use the money*. Money from any 529 plan can be used to pay college expenses for any school in any state. So the only reason to prefer your home state’s 529 plan over others is the potential for a tax deduction. While contributions to a 529 plan are not deductible for federal tax purposes, some states offer a state income tax deduction for residents who contribute to their home state’s plan. That deduction can be valuable, and in some cases might outweigh other negatives about your home state’s plan, such as high investment fees. You can find out if your state offers a deduction for 529 plan contributions here: FinAid State Tax Deductions for 529 Contributions. If your state offers an income tax deduction, you can move on to Step 2. If not, you can skip ahead to Step 3. *There are state-by-state differences in how the money can be used when it comes to prepaid 529 plans, but that’s the subject of a different blog post and in most cases I don’t think that a prepaid plan will be the right choice anyways. Step 2: Is the state income tax deduction worth it? The amount you can deduct – The more you can deduct, the more valuable the deduction. Your marginal state income tax rate – The higher your tax rate, the more valuable the deduction. Investment fees – The more your state’s 529 plan charges for its investments, the less attractive it will be. The amount you’ll contribute – Contributing more can increase the value of the deduction, but it can also increase the value of finding lower investment fees elsewhere. The hard part is figuring out how all of those variables fit together for your specific situation. Lucky for you, I made a spreadsheet that you can use to run the numbers yourself! Here it is: 529 Plan Comparison – Tax Deduction vs. Investment Fees. To access it, simply click the link, click File in the top menu, and either Make a copy… to use it in Google Sheets or Download as to download it in Excel. Start with the Variables column and update the Home State field. Update the Income Tax Rate field with your personal state income tax rate. You can find that here: Bankrate State Tax Rates. Update the Max Annual Deduction field with the maximum dollar amount that you can deduct each year. You can find that information here: FinAid State Tax Deductions for 529 Contributions. Update the Home State Investment Cost field with the cost of a typical investment within your home state’s 529 plan. This isn’t always easy to find, but you can go to the website for your state’s 529 plan and look for something about fees and expenses. You can also search for a program description, which is likely a big, long, ugly PDF. But you can search for fees within that PDF to find each investment option’s expense ratio, which is what you want to plug in here. In most cases, you should look for age-based investment options because of their ease of use, and index-based investment options because of their lower cost and likelihood of better results. Leave the Out-of-State Investment Cost field as is. This is set at 0.16% because it’s what New York’s 529 plan investment options cost, and that’s one of the lowest-cost plans available. Update the Current 529 Savings field to reflect your current 529 plan balance. If you’re starting from scratch or you’d be starting a new plan, you can leave this as $0. Update the Annual Pre-Tax Contribution to the annual amount you would be contributing to your home state’s plan. Leave the Annual Return field as is, or update it if you’d like. Keep in mind that this return will include the years just before you child goes to school where you’ll likely be invested fairly conservatively, so a lower average return is likely. Once all those variables are set, you’ll be able to make an informed decision about whether to use your home state’s 529 plan or to use another plan. Simply compare the expected savings in each plan after X years (based on your child’s current age) to see which one is likely to come out ahead. If your home state’s plan comes out ahead, you can feel comfortable using it to take advantage of the tax deduction. If not, you can move on to Step 3. Investment returns are not guaranteed and in real life different plans will produce different returns. Both the size and the sequence of the returns you receive will impact the results. It’s unlikely that you will contribute the exact same amount every year and be in the exact same tax bracket every year. Some states (e.g. Indiana, Utah, and Vermont) offer a tax credit instead of a tax deduction. That isn’t factored in here. Some states (e.g. Arizona, Kansas, and Pennsylvania) allow you to deduct contributions you make to ANY 529 plan, even out-of-state plans. There are always other variables in play when it comes to taxes and I have not accounted for all of them here. Still, this will get you in the ballpark and allow you to make an informed decision instead of a hopeful guess. If your state doesn’t offer an income tax deduction for 529 plan contributions, or if you find that the tax deduction isn’t worth it, here are my two favorite 529 plans that anyone can use. Quick side note: No matter which 529 plan you end up using, this tool will help you choose the right investment mix: Asset Allocation: What It Is, Why It Matters, and How to Get It Right. They offer Vanguard funds (which you know I love). It’s low-cost, with every single investment option costing just 0.16% per year. They keep things simple while also providing flexibility. The fees are simple (see #2) and their age-based options are simple. But you can also mix-and-match their 13 individual portfolios if you’d like to have a little more control over your investments. Unless you want to be really hands-on, this is the plan I would default to in most cases. You can learn more here: New York 529 Savings Program. Utah’s 529 plan is perfect for people who want a lot of control over their investments. In addition to a solid lineup of Vanguard funds, they allow you to invest in DFA funds that are typically only available through a financial planner. They also allow you to create your own age-based investment plan where you choose the specific mix of investments for each age bracket and the plan automatically manages it for you. No other 529 plan that I know of allows you that kind of control. Finally, if you’re working with a financial planner, Utah allows you to give them trade-only access to your account so that they can manage the investments for you. The downside is that it will cost you a little more for these features, with the investment fees ranging from 0.20%-0.60%. You can learn more here: Utah Educational Savings Plan. There’s no way to know for sure which 529 plan will give you the best outcome simply because it’s impossible to know how all the variables will play out over the coming years. But if you follow the steps above, you’ll be able to choose the best 529 plan for you and your family based on the information you have right now and your best guesses about the future. And now I’d love to hear from you. After running the numbers yourself, which 529 plan will you choose and why? Let me know in the comments below! About 2 years ago, I started reading up on 529 plans and decided to start one up for myself, putting in just a mere $25 a month. I figured that was a very simple amount that I could easily afford and a good way to learn about how 529 plans works before I actually had children. Ultimately, I went with the New York plan, which is good to see is one you recommend. My state doesn’t offer a tax deduction, and NY’s plan had Vanguard funds, a $25 minimum investment, and only 16 basis points for fees. I went with their aggressive portfolio, which is 70% total stock market and 30% total international market. I do think it’s a good idea for most people to try to learn about these plans before having kids. Even just putting $25 a month into one isn’t going to be hard for most people. I love hearing that you chose the New York plan! It’s definitely a good one, and it’s great that you got started so early too. Even small contributions can add up to a lot down the line. Hi Matt, Thanks for the great material. The NY plan looks pretty good. A lot seem to hover around similar fees so my question is about which plan makes it easiest for multiple contributors. We want to have one central account but make it easy for parents (us) and grandparents/aunts/uncles (both sides of the family. I’ve looked into upromise and such but seems rather tedious. Preferably, it could all be set up as a recurring investment (as opposed to grandma having to log in once a month somewhere to send her $$). Any ideas? That’s a great question Brian and the honest answer is that I’m not sure which 529 plan makes that easiest. I’ll keep an eye out for it though and will definitely update this post if I get a good answer. And if you find one that works for you, I’d love for you to add your input as well! Great advice Matt. I started 529 plans for my children the month they were born. I live in IL so I chose the IL Brightstart plan which offers Vanguard funds. With that I get the best of both worlds, the tax deduction as well as low fees. I started with a low amount per month per child and also deposit all financial gifts they receive. Every 6 months I increase the monthly investment and I am proud to say that after 5 years I have one year of tuition saved for each child. I plan to keep increasing my monthly investment so that by the time they each reach the age of 13 I have 4 years saved for each child. The biggest challenge I face is to make sure I increase my own 401K investment each time I increase their 529 investments. Don’t “forget” to save for your retirement as well. Thanks for sharing Denis! I love everything about this, especially the part at the end about making sure you’re prioritizing your 401(k) as well. This is my first time stumbling across your website and I must say – what great information! Thank you! And a giant thank you for the Google Sheets document! Superb! I love me some Vanguard Index funds so its’ no surprise I fell in love with NY’s plan as well. I’m looking forward to browsing your website. Again, thank you Matt!